A slight departure tonight from my typical marketing chatter, social media blabber and senseless rants. The past couple of days in Reno (Nevada), our community was devastated by fires that damaged dozens of homes (many now unlivable), threatened dozens more and evacuated approximately 2,000 residents from their homes. Fierce winds caused the fire to spread quickly and made it challenging to fight. Firstly, my heart truly goes out to the victims of this fire. The community has been affected by a number of disasters as of late (train crashes, plane crashes, shootings, senseless deaths, etc). And, as we’ve seen a lot of lately, the community has pulled together and truly behaved as a “community” in terms of support for one another. But, that’s not necessarily what this article is about, either. It’s about the value of peace of mind. Many people were evacuated from their homes and spent most of those first 24 hours with no idea whether or not their home was still standing or decimated by fire. The uncertainty is almost as painful as the reality. I received notice in the afternoon (while I was at work, in the office) that there was a small fire near my house. I wasn’t immediately concerned, as my house was not near the massive fires that were burning south Reno. But strong winds were blowing embers all over the city and starting small fires. I thought to myself, “there’s no way my house is in danger.” But, as only a few minutes passed, my imagination flared up. 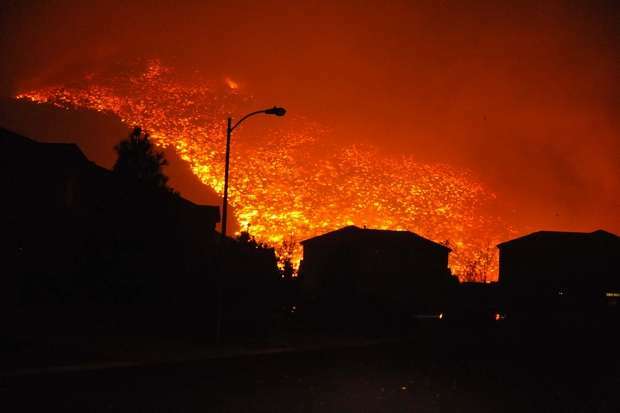 I pictured my neighborhood in the same condition as the images I was seeing of the massive fires in south Reno. I pictured my dogs trapped and surrounded in flames. I pictured the collection of memories burning to the ground and my life changing entirely. I couldn’t stand it any more. What if I had just sat there in the office while my neighborhood burned? I jumped in my car and headed home to check on things. Before I get any further, I need to tell you that firefighters responded very quickly to the fire, which was about two blocks from my house, and were able to extinguish it. Crisis averted. My point in all of this is that the power of peace of mind really sunk in with me. One of the things that make mankind so progressive, beautiful and inventive is our imaginations. They’re extremely powerful. We can see and experience things that may never be. The “dark side” of this is that when we’re unsure of something, our imaginations can paint a hundred scenarios and some of those scenarios cause us to worry. And some of that worry can become so intense that it consumes us and distracts us. My mind raced when I thought there was a chance my house was on fire. I cannot express the level of relief I had when I pulled up and spoke to the firefighter that told me everything would be fine. I cannot express the level of relief I had when I found out my friends were safe and their homes were OK. There is so much power in peace of mind. I understand why people spend the money they do to have peace of mind – whether that’s with safety, investments, insurance, justice or otherwise. When we know for sure, we’re relieved. We remove the torture that our beautiful minds are capable of creating. We all fret about something at some point. We have all imagined a scenario or several scenarios to stand in for knowing for sure. Those companies and people that deal in the industry of peace of mind are in a fortunate position. I’ve found myself understanding why we seek the solace of peace of mind, at most any cost. Mike McDowell dot com is all mine! Cheetos Setting a New Standard for URLs?